In the years between World War II and the emergence of television as a mass medium, American popular culture as we know it was first created-in the pulpy, boldly illustrated pages of comic books. No sooner had this new culture emerged than it was beaten down by church groups, community bluestockings, and a McCarthyish Congress-only to resurface with a crooked smile on its face in Mad magazine. The story of the rise and fall of those comic books has never been fully told-until The Ten-Cent Plague. 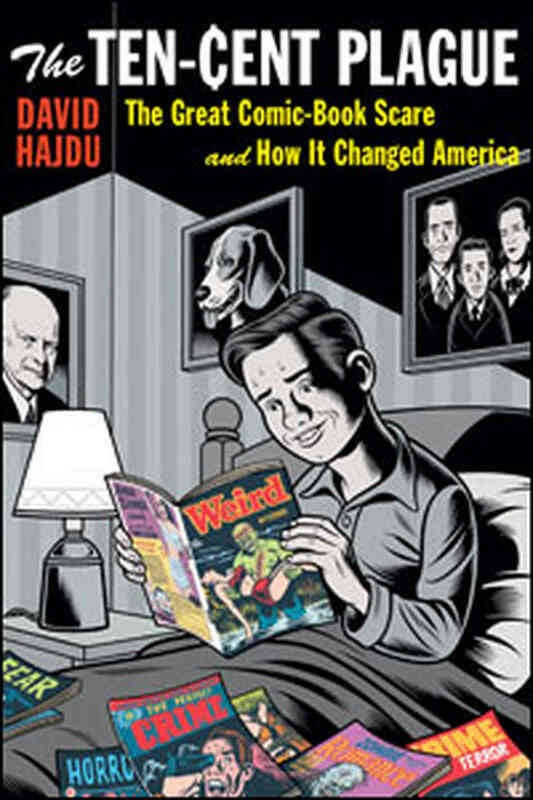 David Hajdu's remarkable new book vividly opens up the lost world of comic books, its creativity, irreverence, and suspicion of authority. When we picture the 1950s, we hear the sound of early rock and roll. The Ten-Cent Plague shows how-years before music-comics brought on a clash between children and their parents, between prewar and postwar standards. Created by outsiders from the tenements, garish, shameless, and often shocking, comics spoke to young people and provided the guardians of mainstream culture with a big target. Parents, teachers, and complicit kids burned comics in public bonfires. Cities passed laws to outlaw comics. Congress took action with televised hearings that nearly destroyed the careers of hundreds of artists and writers. Harry "A" Chesler, Jr., the comic-book packager, applied the "Jr." to his name or dispensed with it as he saw fit, and put quotation marks around the initial because he thought they were stylistically correct, and he was right about that. When he was asked what the "A" stood for, he said, "Anything;" indiscrimination was his middle name. Stubby and gray-skinned, he dressed in striped shirts and a suit vest that often but not always matched the pants; he kept a derby laid flat atop his head, all day, indoors; and he was usually smoking a cigar, proportionately stubby and also gray, with the label intact -- a fancy label that could impress anyone who did not know much about cigars. Chesler, a stickler for efficiency, minimized the creative effort required of his artists to render him in caricature. He set up his studio in a long, open workspace, last used by a wholesaler of buttons and zippers for the garmet trade, on the fourth floor of 276 Fifth Avenue, a ten-story, half-block-long building north of Twenty-ninth Street. Chesler filled the room with rows of used desks, which were cheaper than drawing tables, and he lorded over the shop as if it were a gangland fiefdom: Anyone arriving at work five minutes late would be docked an hour's wages; and on payday, he would sit behind the desk in his office, summon the artists, one by one, and ask each of them, "How much do you need this week to get by?" Late in 1939, Irwin Hasen joined Chesler's staff. Hasen was just beginning to work professionally in art and, at twenty-one, was still living with his parents, who had had a furniture business go bankrupt and were rock-skipping from apartment to apartment in Manhattan to avoid going under. Hasen was an all-around artsy fellow who could have passed for Mickey Rooney's more effervescent, smaller brother. He had taken some drawing classes at the National Academy of Design and the Art Students League, but abandoned his first aspiration, fine art, as impractical. He had a good compositional sense and applied himself to his assignments for Chesler, among the first of which was a detective story about a counterfeiting ring, published by Timely. Not long after Hasen stacked the pages and submitted them to his boss, Chesler walked over to his drawing talbe and told him, "Good work, kid! That's a hell of a job you did! I'm going to play that up big!" At the end of the day, as Hasen cleared up his materials, he realized that he had inadvertently given Chesler only the top page of the story he had done. All the sheets of drawing paper underneath it were blank.